Litter dropped from restaurant-goers on Elida Road flies south and often gets trapped by the plants lining the train tracks. LIMA — This prior Sunday, in a single afternoon, 140 individuals ended up packing 75 trash bags full of litter within walking distance of Town Square. A week later, the square has already started to gather more debris. Cigarette butts litter the legs of picnic tables, and a few foam cups carried by the wind have taken position underneath shrubbery. For the litter-conscious, Lima’s ability to repopulate an area with trash can be frustrating. That sort of disregard leaves plenty of trash floating around town — enough that five tons of it is pulled out of Lima’s section of the Ottawa River every year, affecting water quality and adding to the negative perception often associated with the city. But no matter how prevalent trash can be, a minority of people actually end up dropping litter. In an expansive 2009 study, Keep America Beautiful estimated most free-floating trash is dropped by the 17% of the general populace who choose to litter. But that limited group has a major effects. For example, the Ohio Department of Transportation estimates that the agency has spent $40 million just in the last decade keeping Ohio’s highways free of trash. Thankfully, there are some groups looking to combat litter. One such event is the aforementioned Ottawa River Cleanup. Since 1993, the Ottawa River Cleanup has worked to clear the Ottawa River — one of the primary collectors of trash in the region — of debris that finds its way into the water system after pushed there by wind and rain. With 486 volunteers counted last year, the event is one of the largest annual volunteer events in Lima. 2019’s Ottawa River Cleanup is scheduled for April 27. Registration begins at 9 a.m.
Rachel Hern’s recently formed group Lima Clean is another outlet for litter pick-up events. The new organization was able to bring together 140 volunteers — more than a few who were kindergartners — to wander downtown and clean up its surrounding blocks this prior Sunday. In coming months, she’s planning to organize a pick-up event for each month. Simmons Field has already been tagged for next June, and Hern is working with the Lima Locos to provide free tickets for volunteers who come out for the event. 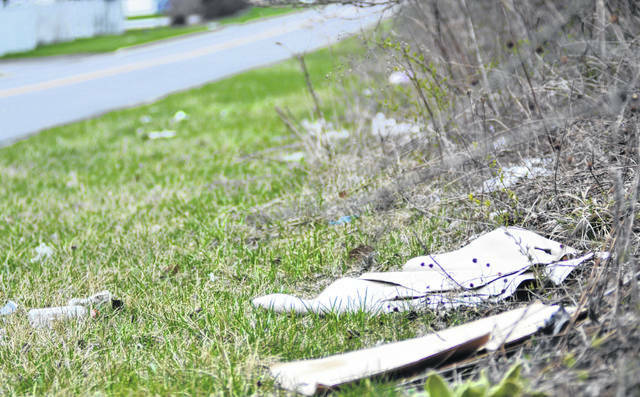 Pop-up pick-ups, or random nights of litter gathering, are also being considered. Eventually, Hern would like to see ownership of certain areas by individual groups or businesses to keep them clean on a regular basis. A similar program already exists through the Allen County Soil and Water District. If a group decides to volunteer to keep an area clean, they are provided with gear, such as trash bags and rubber gloves, as long as they clean the area they have identified at least twice a year. “We got about two dozen groups, individuals to Boy Scout groups to school groups, that have adopted areas. We just had a new one come in — Elm Street between Cable and Eastown — this past week,” Seibert said. The city also plays a role in reducing trash. While much of the city’s litter is dropped by individuals, trash also gets into the stormwater system due to irresponsible trash disposal. To cut back on such activity, Lima’s code enforcement officers will often fine those who may have too much trash parked on their lawns. When someone is cited for a code violation, the city gives out a $50 fine although it could be waived if it’s a first-time violation. The city may send out a contractor to clean up the lot if the trash isn’t picked up, which balloons the tax owed to the city by the property owner. At the end of the day, however, much of the responsibility to keep Lima clean depends on its individual residents.